Following is an overview of the supplies you will need to create your own traditional-style Mountmellick embroidery. Vetty Creations carries a full range of Mountmellick embroidery supplies that are available for purchase through this website. The thread used for Mountmellick embroidery is white matt cotton thread. It is important that the thread has no shine. Perle coton, mercerised crochet/knitting cotton and candlewicking thread are not suitable to use. Traditionally, non-mercerised knitting cotton would have been used for stitching the Mountmellick embroidery, and also for the knitted fringe. It was of a fine twist, and not furry or fluffy. Generally one or two weights of thread were used throughout the one piece. Today there are three weights of white matt cotton thread that are used in Mountmellick embroidery. These threads have been developed in the UK with advice and assistance from Mountmellick stitchers themselves, specifically for use in Mountmellick embroidery. No 2 (thinnest) shown top, is used for small areas of intricate detail. No 3 (medium) shown in the middle, is commonly used for most Mountmellick stitching. No 4 (thickest) shown furthest on the left, is mostly used for very heavy work and padding of satin stitch. Some time back I wrote a post for my blog on Mountmellick thread, explaining what makes it unique. I recommend that you read it to learn more. Vetty Creations supplies each of these threads in skeins. Purchase Mountmellick thread. The fabric traditionally used for Mountmellick embroidery is cotton satin jean, also sometimes known as cotton sateen. The satin weave surface of the fabric, with its slight sheen, contrasts with the matt of the embroidery thread. Cotton satin jean can come in a range of weights. For Mountmellick embroidery, it should be a medium to heavy weight so that it can take the weight of the heavily padded and knotted stitches. There are a number of cotton satin jean fabrics on the market that are suitable for Mountmellick embroidery. One of them starts off cream and needs to be boiled white. However, most of them are white. Damask fabric is not suitable for Mountmellick embroidery as the woven patterns detract from the embroidery. Vetty Creations stocks a heavy-weight 100% cotton satin jean, and a medium-weight polycotton satin jean fabric. Purchase Mountmellick fabric. Traditionally, the same white, finely twisted, non-shiny thread was used for the knitting and embroidery. When knitting the Mountmellick fringe, three, four or five strands of cotton are used together to create fullness. At one of my Mountmellick classes, a student devised a clever way of using two balls to knit with four strands. You can read about it on my blog. Vetty Creations supplies 50g balls of 4-ply knitting cotton. Each ball comes with complimentary instructions for two knitted fringe variations. Purchase Mountmellick knitting cotton. The needles used for most Mountmellick embroidery are Chenille needles (around No 22). These have a sharp point to assist with sewing through the heavy weight fabric. Darner needles (often No 1-3 and 14-18) are used for bullion stitch and french knots. Usually straw (milliner's) needles are used for knotted stitches as their eye is the same width as their shaft allowing the thread to pass through the stitch easily. However, the thread used for Mountmellick embroidery is too thick to fit through the eye of these needles. Darner needles are therefore the best option. Vetty Creations supplies a range of hand embroidery needles for Mountmellick embroidery. No 9, 10, 11, or 12 (imperial) or 3.75, 3.25, 3, or 2.75 mm (metric) knitting needles are usually used to knit the Mountmellick knitted fringe. Larger needle size will produce larger scale fringe, with relatively longer loops, while smaller needle size will produce a more compact result. Always use metal knitting needles as plastic or bamboo will snap because of the multiple strands of thread used. Cotton thread does not "give" or stretch like woollen yarn, and when there are multiple strands, any "give" is even less. You will need a hoop or a frame to work your embroidery. This is because of the large amount of knotted and padded stitches that will require care to keep the fabric flat and unpuckered. Without a hoop or frame this would be extremely difficult. When working with a hoop, which you will probably need to move around your work area on a larger piece, you will need to take care in ordering your stitching. Work the flatter stitches (ones that don't create a lot of bulk) first, such as chain stitch, stem stitch etc. This will enable you to continue moving the hoop around. Work the thickest, most bulky stitches last e.g. bullions, padded stitches, French knots. Once these have been worked it is much more difficult to move the hoop around and continue to keep the fabric taut. Another option is to use a quilting hoop as these are designed to take more bulk than regular embroidery hoops. This is not a complete solution, as the fabric may still loosen as you work (or not be able to be made taut in an even way), but it should help. Vetty Creations supplies a range of Mountmellick project kits with supplies and full instructions. Purchase Mountmellick embroidery supplies and kits. 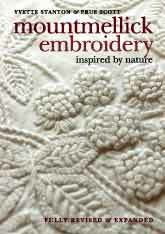 For more information on Mountmellick embroidery, purchase Yvette Stanton's step-by-step instruction manual "Mountmellick Embroidery: Inspired by Nature"